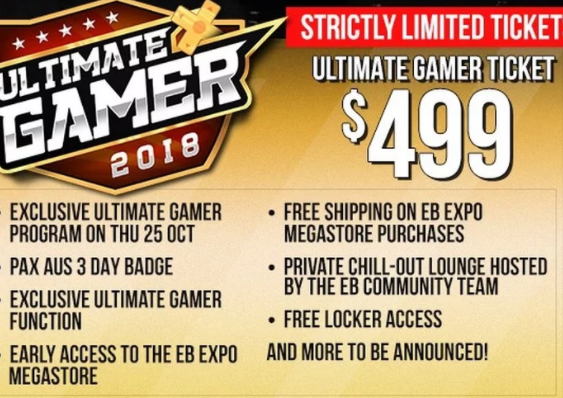 Kotaku is reporting that early bird tickets are going on sale for this year's PAX Australia via EB Games, and those tickets include the ability to buy an "Ultimate Gamer" ticket for the cheap, cheap price of $499. That means you could take your girlfriend or boyfriend, son or daughter (or other significant person in your life), and still have enough left over from a clean $1000 for a cup of instant coffee! That 'ultimate gamer' pass buys you crap-all. Free shipping on EB Expo megastore purchases while at the show... and unless this store has some incredible stuff you won't ever be able to get anywhere else, you could just go to your local EB Games and by the same damn thing once the show's over. Access to a private "chill-out lounge" that, unless you really are wealthy enough to spend $1000 on tickets, is going to be a really lonely experience because you'll be there by yourself. Free locker access (saving $5 there! ), and an "exclusive ultimate gamer function and program" which is incredibly thin on details, but for $500 I would hope they'd be flying Goichi Suda himself down to drink beers with you at the function (that dude puts on incredible parties, just saying from experience). But this is EB Games. Let's face it. There won't be Goichi Suda. Those "exclusives" are just going to be modelled around selling more junk to you. All this Ultimate Gamer pack sells in terms of the event itself is access to PAX Australia via a 3-day badge. No hint at this stage of special treatment, like the ability to jump lines (a pass that has previously existed for a premium). But let's just assume that EB Games and PAX do a deal where these Ultimate Gamer types are able to bypass all demo lines and play everything they want with almost no wait time. You're still an idiot if you buy this pass. Here's some hard truths about PAX. Especially now that EB Games is also involved: PAX is not done for alturistic reasons, and it's not a theme park. It's not Disneyland. It's not Universal Studios. PAX is an event that the industry puts on exclusively for the opportunity to sell more stuff to consumers. Every company that has a booth there is using its marketing budget to pay for the booth, and there's a reason for that. The entire event spins around rampant and unchecked consumerism, and while you could argue that those panels that PAX puts on as part of the show give it some kind of editorial content above and beyond the sales pitch and thus legitimise it as an event, even then, that editorial content is designed to get more feet through the door and more backsides on seats so that the people that pay PAX for booths can sell you their stuff. The only reason the panels exist is they help the booth holders sell more stuff. Frankly, with that in mind, it's an insult that PAX charges for attendance at all. It's like if Facebook were to start charging for people to use it, when the company already gets its pound of flesh from consumers by selling their data to advertisers. It's double dipping, and with PAX teaming up with EB Games, a retail organisation that exists exclusively to sell yet more stuff, the weighting towards consumerism is going to get even worse this year. So, back to the assumption that this Ultimate Gamer pass also lets you jump queues for the demos. You're nuts to think that's good value, even if you get to play every single game on display a dozen times over the three day period. Why? Because you are paying money to play games that you're going to buy in just a few months. You are paying money to have salespeople, via the demos, give you their sales pitch. I understand paying money for the fast passes at proper theme parks, because a theme park is modelled around providing these experiences to people without the same commercial intent. Yeah, Disney wants every bit of cash you've ever earned, but you go to Disneyland, and that It's A Small World Ride doesn't have a sales booth set up at the end of the ride with the CD soundtrack. Ignore the dedicated shopping areas of those theme parks and you can have a delightful day where the hardest sell you'll come across is which character mascot popcorn bucket you want. Last year when I went to Universal Studios in Osaka it was a choice between waiting in line for 3-4 hours for every single ride, or actually spending the day riding rides. The VR theme park in Shinjuku is still new enough that it doesn't need fast passes (from memory), but if it did, I would understand that too, because VR Mario Kart isn't something you'll be doing in your lounge room any time soon. But paying money to play a carefully constructed demo designed to make you want to pre-order a game is both offensively exploitative on the part of the publisher and PAX organising staff, and mind-blowingly stupid on the part of the consumer. And in the absence of anything else of genuine worth in what this Ultimate Gamer package is proposing, it just boggles the mind to know that the damn thing is still going to sell out. There's plenty to like about conventions like PAX, don't get me wrong. I know every year half the people I follow and talk to on Twitter love the opportunity to head down there, catch up with friends, and share in the gaming hobby that we all love. I don't begrudge PAX for what it is, and what it offers, but people need to call a spade a spade and recognise that they are paying money to hear the sales pitch of companies that want to flog you stuff. Within limits, it's fine to pay PAX participate in that because of the benefits that the show does offer, but $499 is so far beyond that limit that it's genuinely offensive. So don't be stupid. Don't buy this pass.